A ransomware crypto-virus that goes by the name of Mahasaraswati is spreading around the Web. The email left for victims with instructions to pay the ransom is located in India, although the origin of the ransomware and its creator is unknown. The virus locks files and puts an extension ending in [email protected] to each file. The money demanded as a ransom is 3 Bitcoins. To see how to remove this ransomware and how you could restore your files, you should read the article carefully. 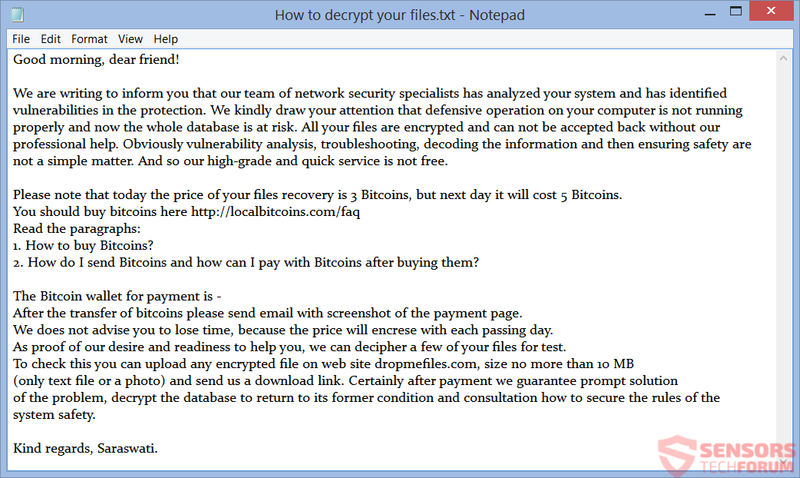 Short Description The ransomware encrypts files with an extension ending in [email protected] and demands a ransom of 3 BitCoins. Symptoms The ransomware will encrypt files on your computer. Two files named How to decrypt your files are created, containing the instructions for payment. User Experience Join Our Forum to Discuss Mahasaraswati. Mahasaraswati ransomware is delivered in a few ways. As other modern ransomware viruses, this one also uses spam emails as the main delivery method. The emails have files as attachments that have the malware code inside them. In some rare cases, the body of the email itself might activate malicious code. Getting infected with the ransomware is also possible through social media websites or via file-sharing services. These mediums might also spread malware code disguised as an executable or a file of a useful app. The best prevention tactic against any ransomware is to avoid any and all suspicious files. Do not click, open or download files that seem fishy. Mahasaraswati is the name of a ransomware crypto-virus. The ransomware is presented as a program for making your computer secure as if IT professionals are offering you help. The creators of the ransomware try to push the whole thing as a service. They offer not only to unlock your files but also put a good anti-malware on your PC. The truth is that the virus just encrypts your files and asks a ransom, although the ransom note is written in a clever way. For every day, you do not pay the money to revert the changes, the sum increases with 2 Bitcoins. A picture and a text file with the same name are created after the encryption process is complete. Both files are named How to decrypt your files. We are writing to inform you that our team of network security specialists has analyzed your system and has identified vulnerabilities in the protection. We kindly draw your attention that defensive operation on your computer is not running properly, and now the whole database is at risk. All your files are encrypted and can not be accepted back without our professional help. Obviously vulnerability analysis, troubleshooting, decoding the information and then ensuring safety are not a simple matter. And so our high-grade and quick service is not free. of the problem, decrypt the database to return to its former condition and consultation how to secure the rules of the system safety. The ransom note cleverly written and tries to trick you that the ransomware creators are IT professionals trying to help you. Like something else has locked your files, and for them to unlock them, you need to pay 3 Bitcoins within one day. 3 Bitcoins equals to 1350 US dollars estimated from the time of this article being written. According to the instructions, the price for decryption will increase with 2 Bitcoins with each day that passes. Do NOT pay the ransom or even think of paying. Doing this will give funds to the owner of the ransomware, which will probably be used to create a stronger virus or support other criminal activities. No way is there to know if you will get your files decrypted or if you will be contacted back in the first place. The list of file extensions shown above is probably incomplete, but these are the main file that will be encrypted. After the encryption process is done, all files will have the same extension – .id-[The ID of the infected user]. [email protected]. Mahasaraswati ransomware might delete Shadow Volume Copies from the Windows Operating System. You should still check this as there could be different versions of the ransomware in the wild. If your computer is infected with the Mahasaraswati ransomware, you should have at least some experience in removing viruses. You should get rid of this ransomware fast as it can spread deeper through the network and infect more files. The recommended action is to remove the ransomware and follow the step-by-step instructions provided below. Threats such as Mahasaraswati may be persistent. They tend to re-appear if not fully deleted. A malware removal tool like Combo Cleaner will help you to remove malicious programs, saving you the time and the struggle of tracking down numerous malicious files. Threats such as Mahasaraswati may be persistent on your system. They tend to re-appear if not fully deleted. A malware removal tool like SpyHunter will help you to remove malicious programs, saving you the time and the struggle of tracking down numerous malicious files. Note! Your computer system may be affected by Mahasaraswati and other threats. SpyHunter is a powerful malware removal tool designed to help users with in-depth system security analysis, detection and removal of threats such as Mahasaraswati. 1. Install SpyHunter to scan for Mahasaraswati and remove them. 2. Scan with SpyHunter, Detect and Remove Mahasaraswati. Ransomware infections and Mahasaraswati aim to encrypt your files using an encryption algorithm which may be very difficult to decrypt. This is why we have suggested several alternative methods that may help you go around direct decryption and try to restore your files. Bear in mind that these methods may not be 100% effective but may also help you a little or a lot in different situations. Note! Your computer system may be affected by Mahasaraswati or other threats. Remove Mahasaraswati by cleaning your Browser and Registry. Fix registry entries created by Mahasaraswati on your PC. Combo Cleaner is a powerful malware removal tool designed to help users with in-depth system security analysis, detection and removal of threats such as Mahasaraswati. Step 5: In the Applications menu, look for any suspicious app or an app with a name, similar or identical to Mahasaraswati. If you find it, right-click on the app and select “Move to Trash”. Step 6: Select Accounts, after which click on the Login Items preference. Your Mac will then show you a list of items that start automatically when you log in. Look for any suspicious apps identical or similar to Mahasaraswati. Check the app you want to stop from running automatically and then select on the Minus (“–“) icon to hide it. Remove Mahasaraswati – related extensions from your Mac’s browsers. A pop-up window will appear asking for confirmation to uninstall the extension. Select ‘Uninstall’ again, and the Mahasaraswati will be removed. When you are facing problems on your Mac as a result of unwanted scripts and programs such as Mahasaraswati, the recommended way of eliminating the threat is by using an anti-malware program. Combo Cleaner offers advanced security features along with other modules that will improve your Mac’s security and protect it in the future. Hey !, I found this information for you: "Remove Mahasaraswati Ransomware and Restore Encrypted Files". 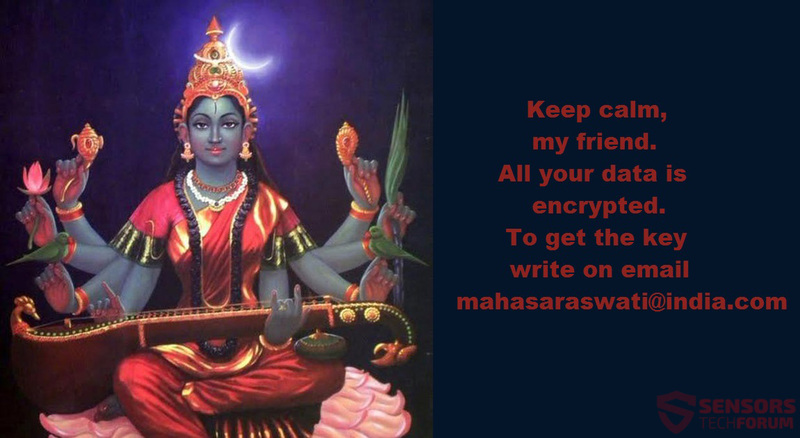 Here is the website link: https://sensorstechforum.com/remove-mahasaraswati-ransomware-restore-encrypted-files/. Thank you.